What other cheese would be good, I dont care for Feta?? I ate this all summer long. Delicious! 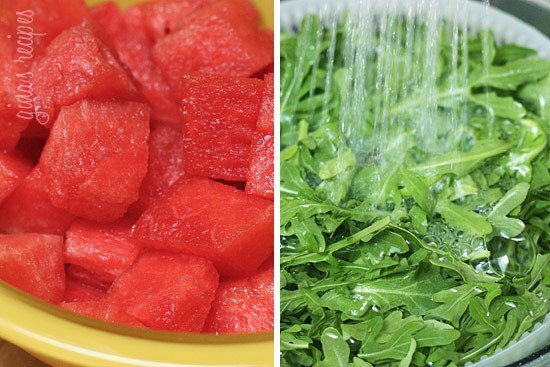 I LOVE arugula with everything, but I never thought to combine it with onion and watermelon, sounds delish. Can't wait to try it! Eating this right now. So good, even better than I thought it would be. Absolutely delicious! Our stores were out of arugula, but I did use some organic baby romaine and herbs and it was divine! Will make this again and again! Thank you! I made this with fish tonight, but I would gladly eat just the salad as a meal. It was very yummy! Delicious! I made this for lunch today, omitting the oil. So yummy! We loved this salad (much to my surprise and delight; hubs dislikes most vegetables) but I personally didn't think the feta added anything. I can't wait to try it again sans feta. Grilled shrimp or chicken would be good. I like this as a starter to eat on it's own as well. I'd love to make this for dinner but stumped on what to serve it with. What about the Asian Glazed Chicken Thighs? Made this tonight this was great! 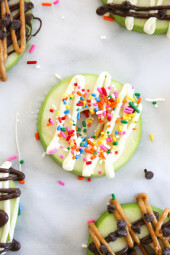 Easy to make and super tasty! I have been trying recipes like crazy. This was excellent, so much so that I've had it as a lunch side 2 days in a row. My only change is that I use grilled red onions. I just had this salad in a restaurant this week!! I can concur with you that it IS good! I'm sure mint would be nice with the watermelon! I bought the plate at Home Goods! They have beautiful dishes!! I added a couple of tablespoons of juice from the watermelon to the dressing and cut the olive oil down to 1 tbsp and it was great with less points. And I added chicken on top to make it a complete meal. This was a great summertime dinner to bring to go see some fireworks. Thanks! Gina..I LOVE the dish your salad is pictured on…where did you get it???? We love this salad – I also add chopped heirloom tomatoes (yellow and orange are pretty) and basil leaves thinly sliced. Had this for dinner today with the filipino ribs and it was absolutely delicious and great for a light summer dinner. Your blog is the best! 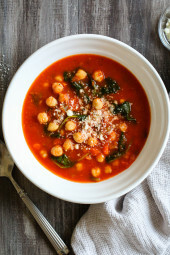 I can always count on great tasting recipes from this blog. I made this today. All the ingredients balance so well! I make this all the time in the summer. The 2 things I do add are chopped kalamata olives and fresh mint, chopped. It really takes this salad to a much higher level IMHO! I hope you all enjoy this, it really is perfect for July! You could use mixed baby greens in place of arugula, and yes, if you are bringing this somewhere, bring all the ingredients separate and assemble right before eating. looks great! 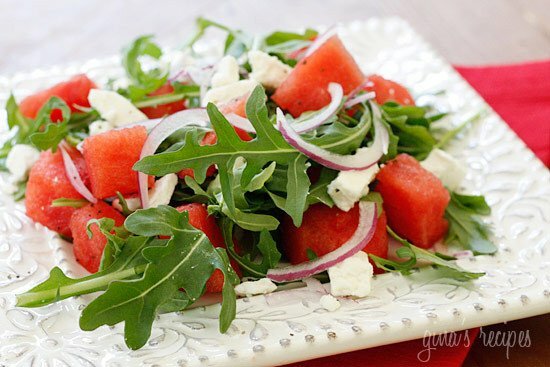 i am sure feta will be great with sweet juicy watermelon! What a perfect dish for the 4th of July! Thank you! To Door – I'm not Gina (who would probably come up with a whole 'nuther way to do it)but I would take the component parts in different containers and then put it together at work in/on the serving dish. That way you could prepare it the night before. How well does this salad keep? I'd love to take it to a work luncheon but I'd have to make it the night before. I love your blog! 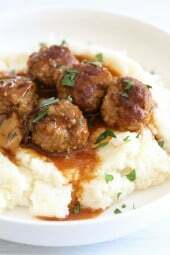 Am starting on a "Make The Old Gal Over" diet, and these recipes will help. I love to cook, so I am sure I will use many of these. Thanks so much. I believe you have changed my life!! I have spent so much time on this blog in the last 24 hours that I can't even remember who to thank for getting me here! I hate following recipes because I can not put half of the fattening, processed stuff in them that they call for….so I end up substituting…and since I'm no chef, it usually turns out AWFUL!! So I stick to plain and simple or just snap and throw in the towel! I can not believe that you can do this all with a full time job, but bless you for sharing!! P.S. what kind of food processor do you have? I need one, and would love your imput!! What a gorgeous combination! My mouth is watering. Slurp…. Any ideas for what I could substitute in place of arugula? I have tried to like it on several occasions but just don't. 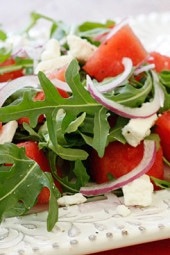 I do LOVE feta, watermelon and red onions though! I have made this salad with Butter lettuce and watercress. The watercress gives it that same kind of peppery kick that arugula does. Really any kind of greens other than iceberg lettuce. Baby spinach would be great,too. I love watermelon, I just hate cutting them open! Rocket, yes I heard that! Not sure how it effects the points with fat free feta, I can guess maybe it would reduce it by 1 pt since feta isn't a fatty cheese to begin with. Mmm, I love arugula! Gonna try this Gina! Arugula is rocket in the UK. Hmmm…I love sweet, ripe watermelon. I'm a feta cheese fan. So combining them into a salad must be a real treat. Looks colorful, delicious, an oh so summery. Thank you for the recipe. I was also introduced to this salad recently in a trendy restaurant and absolutely fell in love with it. Thank you for the recipe. My grandmother always said that watermelons are at the best and at their peek right around 4th of July. So needless to say with that holiday fast approaching I have been craving watermelon. Thanks for sharing this fresh salad! WOW! I have always thought that this is a traditional Persian salad that only Persian have it at home! This is super tasty… trust me! Any idea what the PointsPlus difference would be if you used fat free feta? If you have a lot of arugula, make an pesto with it, with spinach, walnuts, parmesan, and a jalapeño if you like a kick. SO good! I also wilt some in with a German type potato salad. Love arugula! This looks great! Do you mind if I post this and change it a bit and link back to you? I made this for a memorial day block party. Everyone LOVED it. And I loved that it was super easy to make! Arugula is a peppery tasting leafy green used in salads. It’s my personal favorite and great with shaved parm. I have never heard of arugula, what is it? I have so much Arugula that I dont know what to do w/it! Thanks for this idea, looks great. I will for sure make it!